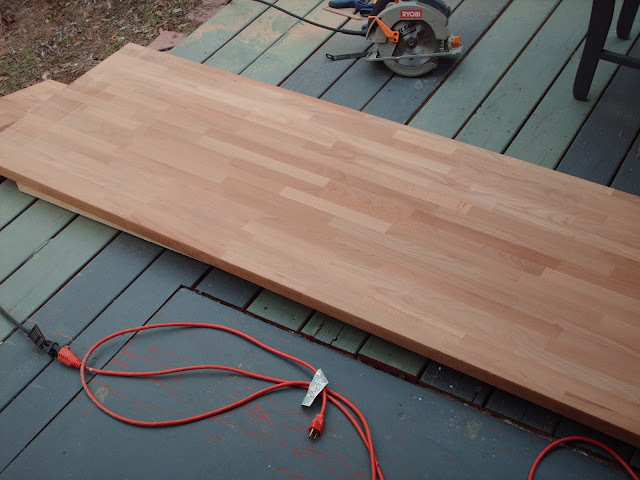 WARNING: this is a really long post that is not very interesting to most people unless you want to know about how we stained and cut an undermount sink for our butcher block countertops. If you don't want to read all of that, just scroll down to the bottom to see my countertops in all of their beautifulness. 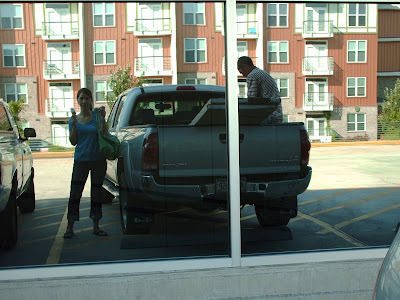 So off to Ikea we went to pick up the countertops. Ikea is a dangerous place, but we made it home with only countertops, an apple slicer, a plant, a pot lid holder, cinnamon roll & an ice cream cone. 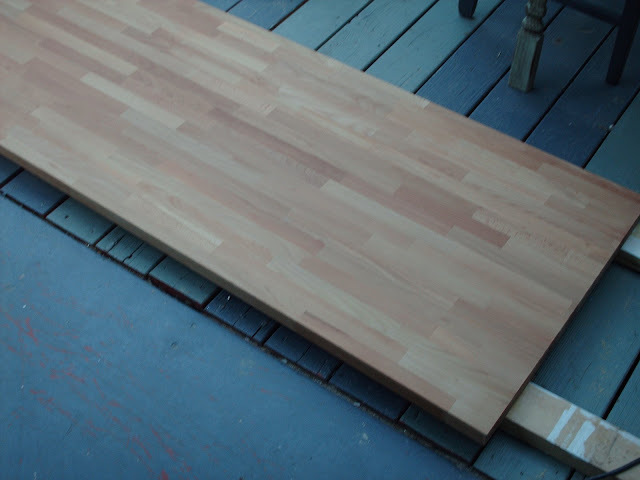 We chose the Numerar 1 1/2" beech butcher block countertops. In the old house we had the Pronomen 1 1/4" , which I would have gone with this time as well, but they didn't have any in stock. With the old kitchen, we didn't stain the countertops. I just applied about many coats of Tung Oil to the countertops and kept the natural beech color. But in this kitchen, I wanted the countertops to be darker. 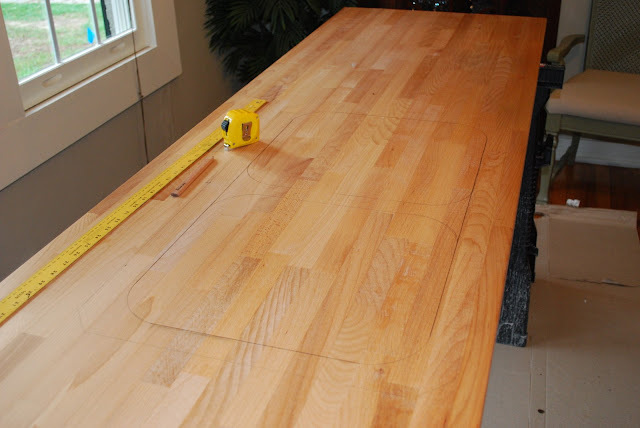 We started by measuring the length of countertop we needed and cut off the excess. Once the countertops were cut to size, I sanded off the factory finish using 120 grit sandpaper and the mouse sander, in the direction of the wood grain. I then used 220 grit sandpaper to smooth out the surface. can you tell the wood is a little lighter now that the finish is off? Next it was time to cut the hole for the sink. Since we were going with an undermount sink, we weren't sure if we wanted to cut the hole since there was no room for a mistake. I called around to several cabinet shops to see what they would charge, all said around $300 not including formatting and sanding the hole. So needless to say, we did it ourselves. I bought an undermount sink on clearance for $60, originally $290 so that was a great deal. But I wanted to double check just to make sure the template that was included in the clearance sink was the correct one, well it wasn't. So we just put the sink on the underside of the countertop and made our own template first tracing the outside of the sink and the tracing the inside of the sink by sticking our hands through the drain hole. Make sure you look under your cabinets to measure where the sink should go and don't go off of your old countertops. We had some wood pieces inside our cabinets we wouldn't have know about if we had not looked, also if we had gotten the cabinet shop to cut the hole, they would have cut it wrong since the wouldn't have measured off of our cabinets. Measure then check your measurements. Repeat about 5 times until your paranoid husband is happy and your dog gives you the side eye. After we got the sink drawn off where we wanted it, it was time to cut. Eric used a circular saw to cut the straight parts and a jigsaw to cut the rounded corners. We had known that it would be a pretty rough cut job with the jigsaw so I bought Eric a belt sander for our "anniversary" to sand the sink hole with. A belt sander is a must have for this project. It was only $70, which is still a lot cheaper than the $300 (our lowest quote) for someone else to cut the hole. He used the belt sander to smooth everything out and then finished it up hand sanding with 220 grit sandpaper. I was so excited, I guess I didn't take pictures. After the sink hole was cut and smoothed out, I went over the countertops with a tack cloth to get all of the additional dust off. The I applied a wood conditioner. This is a very important step, as it will help the stain have an even appearance with all of the different cuts of the butcher block. After the wood conditioner dried, I went back over the countertop with 220 grit sandpaper to get all of the raised grain sanded off, and the used a tack cloth. Then it was time to stain. We used Minwax Special Walnut #224. I read to use an oil based stain, but we already had this so I took the risk. So far so good. I put on 2 coats of stain. 1 3/8"circle cutter to cut the holes. Next I had to seal the countertops to protect the finish. Like I mentioned before I had sealed the old countertops with tung oil, and would reseal them every couple of months. Since I was going with an undermount sink this time, I wanted something a little stronger to protect the sink area that would constantly be getting wet. I had read that Waterlox was the best way to go. It is no where to be found in these parts, so I ordered it online. I order a quart and used about 3/4 of the can on about 13' of countertops. I used the Waterlox Original Satin Finish TB6044. I sealed the underside of the countertops (to prevent warping) two times and I sealed the tops of the countertops five times. (Make sure you finish sealing all the coats one side completely before staining the other side. I am really impatient when waiting to see how projects turn out and I know I would have gotten excited and flipped the countertop over to stain the top side while the bottom wasn't completly dry and marred the finish.) Around the sink hole I applied 12 coats of Waterlox. I am sure that was overboard, but we cut the faucet holes out two days after I started to Waterlox the other countertop, so I would just Waterlox the sink hole everytime I Waterloxed the countertop. I also put Waterlox in the faucet holes, and I am glad I did because it was hard to get all of the water around them up after I washed dishes yesterday. The Waterlox did lighten up the stain on the countertop about a shade. That was fine with me, I had read that it would happen. If you don't want that to happen I would recommend putting an extra coat of stain on the countertop. I also read to wait several days after staining before applying the Waterlox. I waited four days. I used rags made from old tshirts to apply the waterlox. I would apply a coat of WL before work and then one before bed. Between coats I sanded with fine steel wool and used a tack cloth to make sure it was extra clean. After everything dried it was time to install the sink. We turned the countertop upside down and set the sink on top. Then we got under the countertop to maneuver the sink into the right place. Once we were happy with its position, we traced around it with a sharpie so we would know exactly where to place it. We got back under the countertop just to double check we like where the sink was. 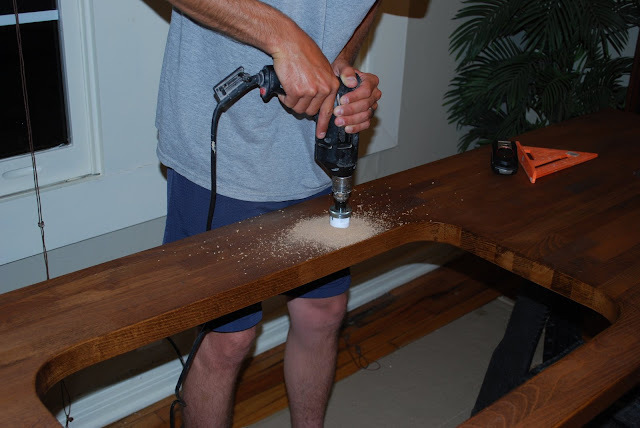 Then we predrilled the holes for the screw clips that hold the sink onto the wood. Make sure you don't drill too far!!! Then we loosely attached the clips so we wouldn't have to do it after the silicone was put on. We then put silicone where the sink was going and set the sink on top of the silicone. After that we flipped the countertop back over and put silicone between the sink and the countertop. We flipped it back over so it would have the weight of the sink to help the silicone adhere. After the sink was set into the silicone, we tightened the clips. Then we flipped the countertop back over and put silicone between the sink and the countertops and cleaned up the excess silicone. 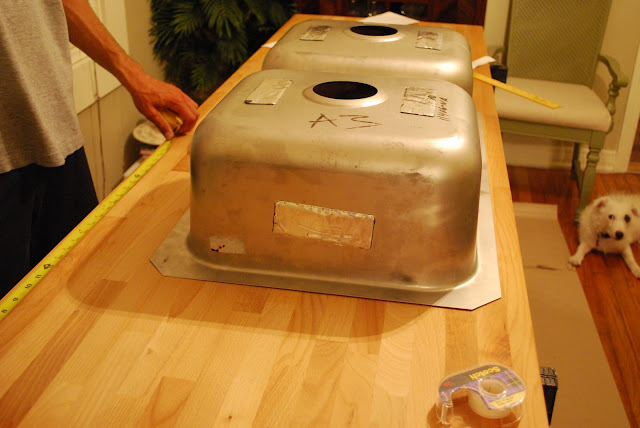 We then flipped the countertop back over so the weight of the sink would help the silicone adhere properly. Before installation we went ahead and attached the faucet parts so we wouldn't have to crawl under the sink to do it and to make sure there weren't any surprises, which it was too late to fix any surprises anyway. Where the dishwasher was we attached foil so that the moisture from the steam wouldn't affect the wood. The installation went pretty well since we didn't have any corners, just two straight shots with no seams. Just make sure you predrill all of your holes and don't go too far! can you see a peek of my brick floors?! The other side of the kitchen has the same countertops, it just had all of the junk that goes under the sink cabinet sitting on it, so I didn't take its picture. I know these pictures aren't the best, but I was working with what I had this morning. If you think these countertops are hideous, I am sorry. But they are the loves of my life (besides Eric and Claire of course). I was 2 minutes late for work today because I just stood in the kitchen looking at them. I am so proud of Eric for all the work he did in the kitchen. 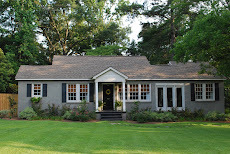 I think it is awesome, but he still said his irrigation system is cooler to him than getting a new kitchen! UPDATE!! I've had a lot of comments asking about how the BB countertops have held up since this post click HERE to find out! 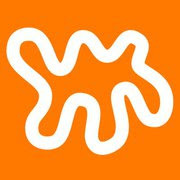 ALSO: For more info on installation or if you have a join in your countertops read this great post by Stillwater Story. UPDATE!! To see how everything else in the kitchen turned out click HERE! 2016 UDATE: I really hope to do a proper update post sometime soon. I still get a lot of questions about how our counters have held up and if I would do it again. Short story is Yes I would do it again. They do have scratches and a few worn spots but it doesn't really bother me. I think the spots are from Dawn with peroxide dish soap. I am planning on putting a fresh coat of stain and Waterlox in the near future. Wow! Y'all need to start a business. I am amazed! They look great! Incredible! ya'll never cease to amaze me!! Great job! Vanessa, I found your blog and I have to say I am quite impressed with you and E's handiwork! Your house is looking great! wow. not only are those counters AMAZING, your tutorial is truly fabulous! i don't know how to do ANY of that. none. i can't wait to show scott tomorrow - he's going to be so jealous. very impressive! omg! amazing! i knew you kiddos could do it! what's next? the dining room table? You guys did an amazing job! I love the dark stain. I found your post because I am in the process of installing an IKEA sink, counter top and cabinets and needed some help. Your step-by-step will really help me out. Thanks! Those countertops look fantastic! We recently redid our hardwood floors and that stain was one that I was considering. The floor guys kept telling me to not go as dark as I was thinking and even though I like the color we used, I would love it even darker. how did you mount it to the cabinets? 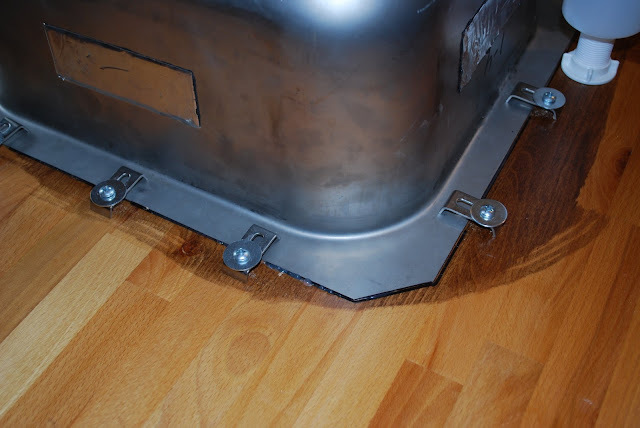 did you have a plywood base or just screw bracket it underneath to the cabinets? any problems with it yet? They turned out great!! We are in the process of doing this very same thing, that's how I stumbled across your blog. Thanks for providing a step-by-step! May I ask how the Waterlox is holding up around the sink cutout? 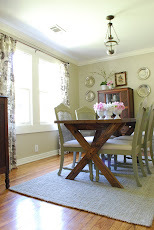 We were looking into doing the stained butcher block thing for our kitchen when we stumbled on to your blog and that was that. :) Now we're just waiting on the stain, to put our waterlox on. For some reason I bought the satin waterlox. Did you use the satin or the original? I hope our countertops end up looking even half as good as yours do! Great job, thanks for the inspiration and very clear directions! Your countertops are absolutely gorgeous! I found you via Lettered Cottage. 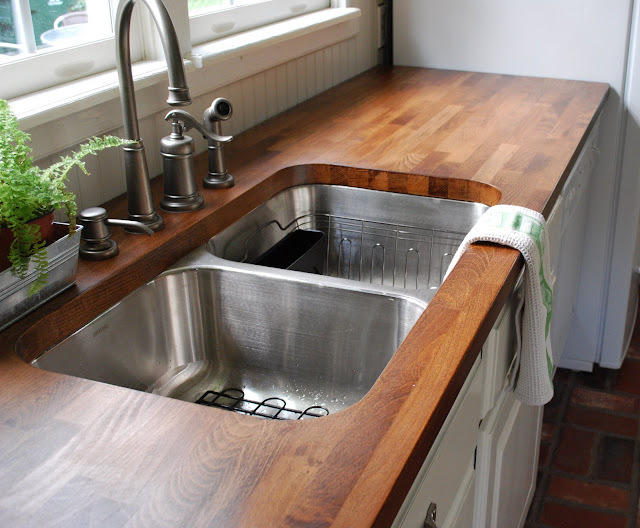 I used the same process on my countertops as well--only a different stain color, and I used the oak countertops. I absolutely love the way they turned out. And by the way, your countertops ARE food-safe. Just thought you'd like to know that. Before I used Waterlox, I called the company to ask that question specifically. They said if you apply it correctly (according to the directions) and let it cure, it's food safe...even if you use it over a standard stain. :) So you made a safe choice and didn't even know it! Anyway, very good job on your countertops. They're gorgeous. I am amazed. You did exactly what I want to do in my kitchen. I wanted to stain my bb and add an undermount sink...which most research I did said you shouldn't do either of those things! After seeing how yours turned out, I can't not do it! Love the countertop. It's gorgeous! And you did an amazing job on the finish. These look fabulous! It makes me want to run out and get new countertops!! I am at your site for the first time today! My husband's name is Eric, daughter Claire Faith.... almost named Paisley Rhue! Amazing counter tops!!!! I'll be back to visit often! Beautiful work! Just found your blog through lettered cottage. I love the dark stain you put on. My kitchen (hopefully) will be turning out similarly. I'm on the hunt for my "white" color to put next to my white appliances (not to yellow, not to gray, not to red). Would you mind sharing (if you know) the color of the cabinets or did they just come that way? 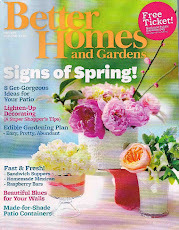 I too found your blog through The Lettered Cottage, and I just have to leave a comment - your countertops are FABULOUS! We are thinking of replacing the countertops in our kitchen, and I love what you've done and am fairly sure I'm going to copy this exactly! Thank you for the very detailed tutorial, it's so helpful to see exactly how you got to that end result! I found your blog through Letterd Cottage as well. I love your counters. What a lot of work, but what a lot of charm they give your kitchen. Well done! Also arrived from Lettered cottage. LOVE it! LOVE LOVE LOVE it!! Thank you for posting so many pictures and such detailed account. I am going to do this very thing when I replace my 70's harvest gold bathroom! Thank you!! This is my first visit to your beautiful blog via TLC but will be returning. Kudos to you and your husband! Your counter looks amazing. I love the deep, rich color. We are just in the planning stages of our kitchen reno on our 1880s Victorian farmhouse. Thank you for the inspiration and tutorial. Your block countertops turned out beautifully. Is there some reason you won't be using them for food prep? They are so handy right there by the sink. I'd think that would be inevitable. It would happen at my house because even if I didn't want anybody to use it for that purpose, nobody listens to me! Again - job well done. I know it's almost a year later, but I just came across your site linked from The Lettered Cottage. I am so impressed with your countertops! So beautiful! These really are beautiful. 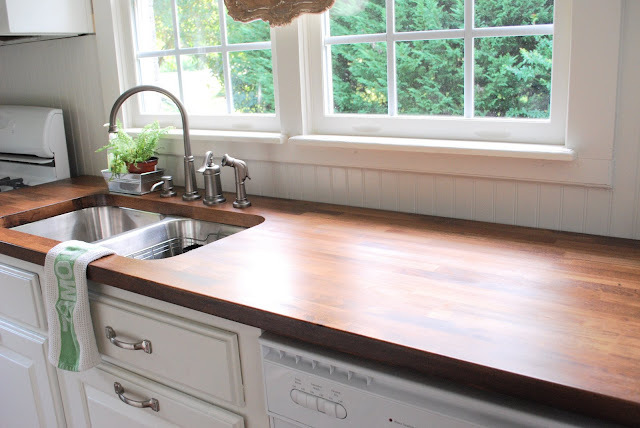 I have really wanted to do this in our kitchen, but some of the things that I have read say that butcher block countertops are a bit high maintenance and ultimately not that durable. Has the Waterlox held up for you? Thank you for all the details. We are getting ready to do this very thing and are so thankful for this help. We are hoping to stain our counters dark walnut to match our hardwood floors and have antique white cabinets. We have 5 children and live in our kitchen, so I'll test the durability factor for you :). This is beautiful! I have countertop envy. Hi! I came over from the DIY Showoff, I LOVE your butcher block countertops! My husband and I want to do the same thing, thanks for the great tutorial, I will send him your way for instructions :) Looks beautiful! So jealous! This is beautiful. Your counters look great but pleeezzz don't tell my husband you can BUY these from IKEA! We also have butcherblock but it took him about 2 months to complete. Ouch! He had to glue and clamp his way thru! You can check mine out at http://flyawayhome-4am.blogspot.com/2010/06/kitchen-remodel.html OR http://flyawayhome-4am.blogspot.com/2010/07/butcher-block-counters.html. great job! I've totally been wanting wood countertops, but the hubby has been opposed. I'll be showing him yours to start nudging him in that direction!!! Yours look fantastic!!! Awesome job! Butcher block is a wonderfully affordable countertop option, but also offers a warm, traditional look to a kitchen. You can obviously cut on this material, but frequent cleaning must be done after food preparation to avoid bacteria growth. Definitely should have done it a long time ago. In my new house - Boos Butcher bloc for sure. We just bought the same countertops from Ikea. My hubby isn't into DIY so I am paying to have everything done, but I am so tired of people looking at me like I have a 3rd eye when I tell them I am not going with granite! I can't wait to have the butcher block, I totally agree with your update and don't think I will have any trouble either. Thanks for the info, I am sure I will keep referring back to it! Wow!! Never really considered butcher block counters until i saw your finished photos. Amazing! I know you bought your undermount sink on clearance but what brand is it? I have looked at a few like Krauss, etc and I like the lines of yours more. I'm not sure about the sink brand, it wasn't in a box. There is a little etching that says "sterling" so that may be the brand. wow - this looks amazing!!! Nice job!!! My wife and I just bought oak butcher block counter tops from Ikea and we loved your article / tutorial, it's the best one we've found and the results look awesome. The dark stain really looks great, nice work and thanks for the post! Where did you purchase your sink at? I bought my sink at Home Depot. It was a scratch and dent so it didn't have a box but there is a "STERLING" logo on the sink. I AM AT A STND STILL OF PANIC!!!!! We want to keep the natural color of our Ikea butcher blocks. I must know, can you condense the steps to how you finished your old counters. I see they are shiny, and I must have that gorgeous look. Please someone help!!!! It took me driving 360 mile, TWICE, and a year to get mine. I don't want to mess this up!!!!!! LaShawnda on my old counter tops I just did a light sanding to get the top coat applied by IKEA off. Then I wiped the dust off and went over it with steel wool. Cleaned off the dust really well and applied tung oil. I don't remember how many coats but I would guess 4 on the top and 4 on the bottom. I would apply and let each coat soak in for a few days, sanding with steel wool between coats. The tung oil protected ok but I am so much happier with the Waterlox and I don't have to reapply several times a year like I did the Tung Oil. Hope this helps! So, if you had it to do all over you would go with the Waterlox? Is that the same basic steps, and does it leave a shine also? Thanks all too much for you vast knowledge!!! P.S. I'm an idiot. Your counter top turned out BEAUTIFULLY. I should have said that first! Well done! What are the odds you would consider posting a follow up to this post with pictures. I am curious about how the butcher block has held up around the sink. Primarily due to the under counter mount. Have you had any issues with water getting between the counter & sink causing rot? I've worked with the IKEA countertops often. (my husband & I rehab houses)...just curious. Thanks! Your countertops look beautiful. We just purchased the IKEA Lagan counters, but haven't installed them yet. I am thinking about using Waterlox to seal them. I am planning to install an undermount sink as well. I was also wondering how your butcher block has held up around the sink. Any input would be greatly appreciated. Thanks! Hi Vanessa, gorgeous countertops! We installed ours about 4 yrs ago and I've hated them so we stripped them down and started over. I went online to order Waterlok and they recommended two products. Can you tell me exactly what to order please? You have been such an inspiration! Thanks so much. I hope you will answer soon, I nerd to order today. Super job, we are planning our countertop project now and I appreciate the length, detail, and humor in this post. Keep up the great work!! ps- congrats on leaving ikea with just watcha' needed. I too have had past issues with this same syndrome. It looks SO beautiful!!! And seriously, brick floors and that beadboard back splash??? I am so jealous. It looks gorgeous. Great job! 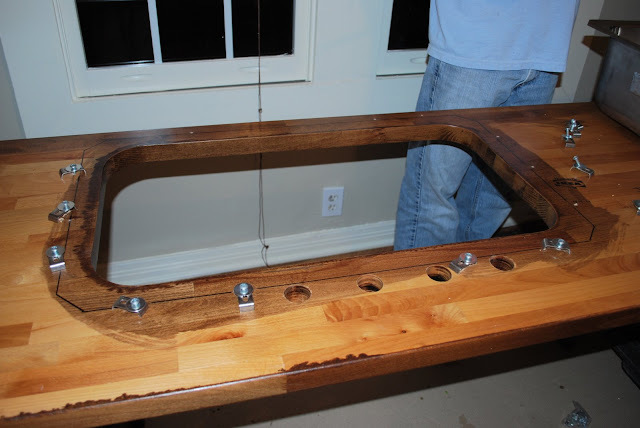 Where did you keep your countertops those several days while you applied the waterlox? We are about to start the process of finishing our butcher block counter tops, and we have the waterlox, but we can't decide whether to put them in the hot/not climate controlled garage or keep them in the den - were the fumes terrible? I can imagine that our mid-June heat in Tennessee could potentially damage the countertops if they are left in the heat, even if it's the shade. Any thoughts? Wonderful I love the look of it!! I think you did an excellent job with the directions as well as the finished product. I did have one question. 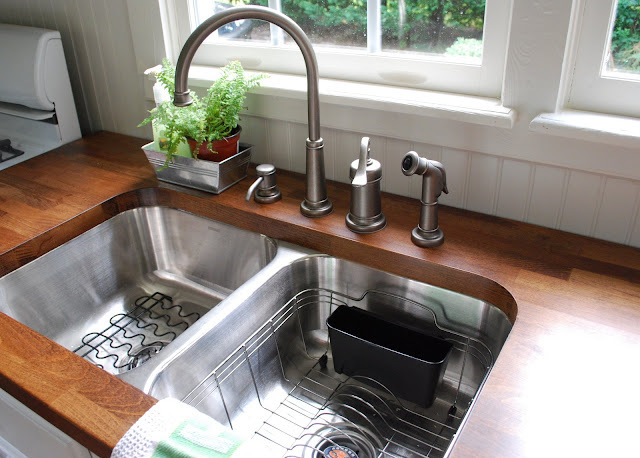 Do you find that any moisture collects where the sink and countertop meet? Or does the silicone take care of that? I am going to remodel my kitchen and I am leaning towards more like granite as the sink and countertop can be made as one piece. I hate when the mold starts to grow because water can get into that area between the sink and countertop.... They are beautiful. great job!!!! @ Amy J- I'm probalby too late answering your question but we had ours set up in our dining room and breezeway. I know with wood flooring it needs to "acclamate" to the temp/moisture of your house so I treated the countertops the same. I didn't want humidity to seep into the wood and warp, expand or contract the wood. @Paula - We don't have a mold issue where the wood meets the sink. The silicone does take care of it. There isn't a huge gap between the two surfaces so the silicone pretty much fills up the gap. Fantastic! I love these and next time I have to replace a counter, I am going to follow your steps! Bravo! This was such a great tutorial. My husband and I just finished our Ikea countertops and we referenced this tutorial at least 6 times. Thank you so much for all the detail you provided. I'm posting my reveal tomorrow and will be mentioning this post. Thanks again! Great Work! The counter tops look awesome. We have been embarked on a kitchen reno for the second time in 7 years....first time we knew we would be expanding the space by aprox 500 sq ft so we tiled them at $280 total cost. AND now have completed the expansion and are ready for our permanante solution. We were contemplating wood because my husband is a professional Chef and has always loved the look of wood. We were on the fence until we read your blog! We ordered our IKEA tops and are now anxiously awaiting their arival. We do have a couple of questions (we are experienced renovators at 10 years working on a 115 yr old Victorian. 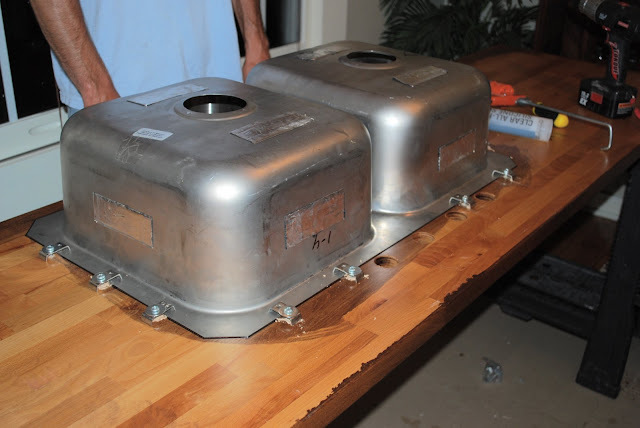 1) What did you use and how did you secure them to the cabinets, and 2)did you poly them in addition to the Waterlox? Did you ever do a follow up post about your backsplash, I cant find it? Vanessa - Did you have any issues with the wall not being square? Did you leave a small gap between the wall and the counter to allow the wood to expand? I love the countertops! I hav butcher blocks from Ikea too and I've said that when we move I definitely want them again. I am so glad to hear about ho you finished them. I only used tung oil and they haven't held up so great. Yours are beautiful! @Seth. Our walls are not square so there is a small gap in some places. It isn't enough to bother me so we didn't do anything about it. In our old house we bought the little trim piece you can put to cover that gap but I didn't like the look so we didn't use it. In that case the backsplash tile covered the gap. In our current home the backsplash doesn't cover the gap, but it isn't a problem. I love love love your counter top! I've been searching for a wood countertop after an unfortunate cooking incident required a kitchen redo lol I searched butcher block on the ikea website but only see the little ones. Help? Because of you and your awesome post we did it. We took the plunge and redid our own countertops. It was so funny to hear my husband and I refer to you, "Well the LADY said to do this..No she didn't she said this...fine lets go back to the post". Yeah...you would think you were our BBF by now by how we constantly refer to you! I just put the last layer of sealant and after that I will take a picture and send it to you!! Do you have a a way for us to send you pictures? Thanks so much for taking the time to post this step by step!! LOVE IT! AND we did the exact same color, everything! lol. this is gorgeous!! i've pinned this to my pinterest. I'm so making one when i get to redo my kitchen! love! Thank you for the pics & the step by step! Pretty much everyone we talked to cautioned us against using an under mount sink with wood, but yours looked so amazing, I knew that was what I wanted! Hi there, great post and very helpful -- thankyou. Did you use epoxy at all or just silicone? Just wondering if the silicone gives enough strength with the clips? My single bowl stainless undermount did not come with the type of clips that you have -- did they come with your sink or did you purchase separately? If you did purchase separately, could you tell me where? I can't find them anywhere. @jambalaya - we didn't use epoxy. I am pretty sure just the clips. I honestly don't remember if our sink came with clips or if we purchased them but I want to say they came with the sink. Maybe ask someone at the hardware store in the sink dept, hopefully they can help out. Thanks for getting back to me. I'll go with the silicone and clips when I can find them. You posted in 2009, is the sink still attached well to the countertop? Hi! We'll be redoing our countertops like yours as well with Ikea but realize we'll need to get two pieces of countertop b/c we have such a long countertop. Does anyone know about sealing two pieces together? My husband and I guessed it would be least apparent if we placed the seam in the middle of the sink so you'd only have a little bit showing at the top and the bottom. Any advice? I don't get it. How did you only spend 40. That is what the Pinterest post said. Hi, I am ready to re-do my countertops, love all the details you noted, thanks! One question- how does this all cost only $40? I would think the stain might be half that and I priced a butcher block 1 1/2 inch at Ijea and the smallest size was $129! Would love to know how you did that!! Thanks again!! Beautiful! I love how the stain matches your floor. The dog side eye made me laugh. They look great! I have my countertops, sink, stain, and wood conditioner and just had a friend cut for the under-mount sink. All I need now is the waterlox but I can't for the life of me figure out which one you used. Their website says to use the oil based polyurethane on counter-tops. Help please! Stargazerss- I'm not sure where the $40 came from. I didn't pin it on pinterest with that tag. They were inexpensive but not that cheap. Anyway for the money they are a great choice. Almost 4 years later we still love them. Timebomb - Everything I know about the product is in this post. It was almost 4 years ago and I'm pregnant now so my memory is shot. ha! I would say I used the satin Waterlox but I'm not sure if that is the info you need. I am pretty certain it wasn't anything with poly. Sorry I'm not much help. Thank you. I contacted Waterlox and they said to use the original for the first two coats then if you want the satin or high gloss finish just use that for your final coat. Fortunately for me I have a hardware store 5 miles from my home that sells all of them so I'm able to do a trial on the original before committing to another $30 for the satin can. Thanks for your help. granite counter tops houston tx which is proven to stand against heat and stains. I admire your blog-site. Thanks. How have they held up with the Waterlox? Thank you. I saw this pinned to pinterest. Which method was better? I have a can of the IKEA product, but I keep debating about the amount of work. You did a great job it sure looks worth it. I love the wood & the stain matches your floor. Just found your blog looking for wood countertop options. Yours look great. From few days I am facaing a problem with the tiles used in the kitchen. And it decrease the decoration look of the kitchen. So I want your suggestion guys about how to replace countertop. Hi, I am in the process of prepping my butcher block counter tops and I also had to order Waterlox online since I live in Illinois. I was wondering about the safety of using Waterlox and its association with cancer. On the back it clearly states "This product contains a chemical known to the state of CA to cause cancer and birth defects". Does anyone know of a more green or safer alternative? Thanks! The counter is absolutely awesome, but I was more amazed to see your dog, which looks exactly like my Angel, it is so rare to see a dog that looks so much like her! Very nice! Polyurethane, or, in fact any usual finishes for wood that you find in the lumber store, including waterbased finishes, shellac, lacquer etc are not recommended for the reason mentioned above. My parent made a mistake to use oil based finish, and now its all dark around the scratches. I use mineral oil, because its transparent and odorless. As a very independent do-it-yourself-er, this post inspires me so much. I'm having to engage large amounts of self-control not to run out and buy BB courter top starter boards. You did a wonderful job on the counters as well as the directions. Thank you! I need new countertops desperately but have a small budget to work with and have been discouraged looking at prices synthesis countertops look fabulous and may actually work with our budget! So excited to have found your blog! Great post, about to do ours in a couple weeks. This was helpful. 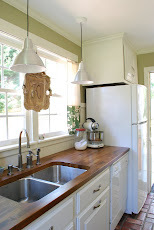 Hey I love this DIY and I want to make these counters... the question. I was talking to my mom about it though and she freaked when I started saying you used stain on the counters. Chemicals seeping into food and all that jazz. Did this occur to you? Did you use a special seal? So pretty! Thanks for the post! This looks wonderful! Do you remember if the Waterlox was super smelly during application? I'd like to leave it set up in the basement so it's easy to apply all the coats but don't want my house smelling with all the off-gassing. We're using the IKEA bb for a new dining table and our kitchen island. I am in the process of doing this and have a question! How many times have you applied the Waterlox since you first put in your countertops? You had mentioned you sealed your old ones every few months so I was curious if the Waterlox was the same! Thanks for such a detailed post of your process!! Can't wait to get mine done! The content of your blog is just what I needed; I like your blog. I was very pleased to find this site. I wanted to thank you for this great read. Thanks you so much for this post. We had Ikea BB in our old kitchen and are getting ready to install it in our new kitchen as well, bit this is the first time we will be staining it and using an undermount sink. Your counters turned out gorgeous! Thank you for all of the information and tutorial on how to stain the Ikea butcher block counters. My husband and I just had the counters installed; we are about to stain and seal the counters ourselves. I'm pregnant, is the smell of the WL unbearable to the point I need to be out of the house until the project is finished? Would it be OK to stay in the house (hours after the WL sealing) to sleep for the night or do you think I should be out of the house for a couple days or something? I sound paranoid, but I read on the WL package this stuff can cause birth defects and is very toxic, but through doing some research online seems like I'd be OK if the house is well ventilated while my husband stains/seals. What are your thoughts? Thanks! I am trying this same process right now! They don't look like yours though :( Can you tell me how long you let the stain sit before wiping it off? Thanks! Janelle, we just stained our Ikea countertops and when first testing it out, we didn't shake the can of stain so the pigment was all settled on the bottom. After shaking and stirring the can real well then it went on how we thought it would. Not sure if you might be having the same problem. Great job on the countertop! My wife and I are actually in the process of doing these, and have been testing the stain on spare pieces of the block.. I was curious if you wiped the stain off after 15 minutes like the directions said, or did you leave them on longer? If you could let me know as soon as you can, thank you so much!! Love reading your stuff, gives us so many great ideas! My mom is doing some remodleing in her kitchen, and I am looking into some good counter tops in edmonton. Any suggestions for sources? Thanks for the help! Good job, looks very nice. med like you had finished tightening the bolts and turned it over for the weight to help the seal and then you did it again. Maybe if we do it and walk through it I will get it. I am so tempted. I had a butcher block table and island and they seem so repairable. burns from untrainable husband. Your first kitchen looked nice also. Vanessa, I was wondering about the waterlox product, was it really smelly and if so how long did the smell last? I have small children and don't want them to be exposed to VOC. Hilarious! So simple and so beautiful at the same time. Thank you for sharing - you gave me quite an idea how to solve my kitchen problem! PS I´d love to see the irrigation system...great mings think alike. Thank you so much for posting this project. 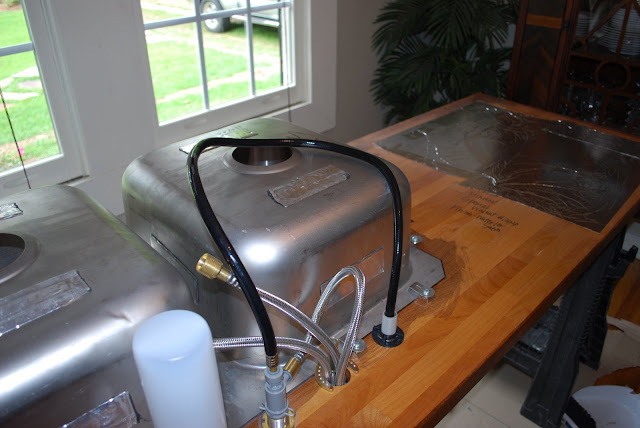 I never knew about the aluminum foil over the dishwasher and, after checking a few other blogs, sure enough it's very important. Absolutely gorgeous! Great job. Looks professional. Wow! Looks beautiful! Makes me want to switch out our granite for the butcher block!!! I noticed you did this a few years ago, how has it held up? 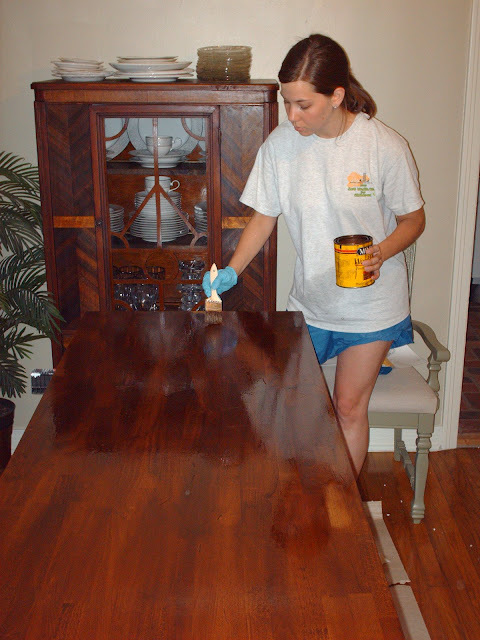 How often have you had to restain/treat the wood? Thanks! Your kitchen looks wonderful! Countertops look fantastic. 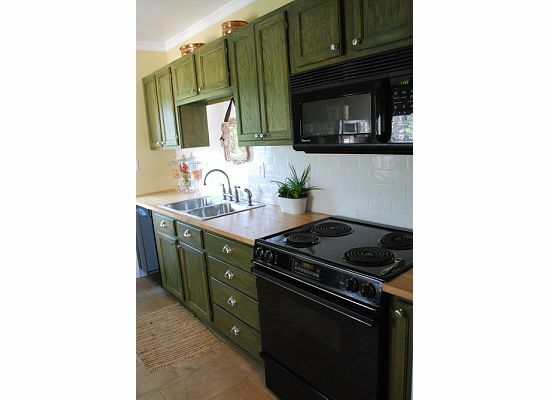 I also like green color cabinets which looks fabulous. Your ideas are very innovative and creative. It will definitely give unique ideas for countertops. You have inspired everyone to update kitchen countertops. Did great job. Do you know what kind of wood is used for this countertops and what kind of treatment should it have so that the water won't ruin it? We don't have Ikea stores in Uruguay I'm afraid, so I should contact a carpenter... Thanks a lot! My boyfriend and I have been creeping on this post for quite some time now, and finally ordered our butcher block counter tops from IKEA online last week!! :) we're so excited!! I've read the follow up post as well, but I was just curious if there is anything that you would have done differently to effect the outcome/life of your countertops? We plan on following this post step by step, with a few other tips from other bloggers. But I have to say, yours is definitely the most helpful! Thank you! Lauren- It has been almost 6 years since we did the counter tops. We are still very happy with them. They still look great. The Waterlox finish has dulled a little over the years but still protects great, I would like to do a freshen up coat for looks. We had to remove the faucet for a repair to it and the wood under and around the faucet was still in great shape. Hope this helps. 1. You talked about sealing the underside before the top. Doesn't that mean putting your stained top face down, and couldn't that damage it? Not sure I understand. 2. how long did you wait between your coats of seal? You said 12 coat around the sink and I am just wondering if you waited a full day between each of those. I can't imagine waiting this long to finish my counters! Did you apply the Waterlox inside your house? Just curious - I have used it once before and it is SO stinky. I'm getting ready to do our counters, and don't have a garage or basement, and trying to figure out where to Waterlox them. Our area has tons of pollen through the end of May, so outdoors isn't really an option. You're counters are beautiful!! What a great job you guys did. Where did you get the dish rack inside of your sink? Brooklyn Ringer- It came from Target but that was 6+ years ago. Your kitchen looks amazing and inspired me to go with butch block on my counters too! I found a great product to finish them and keep a natural look. Not done yet but here is how it's going so far! I loved them, so much I knew that I wanted to use the same countertops again in the new house. Your counters are beautiful! My husband & I are getting ready to install a butcher block countertop on our island. I have read & read, and read more blogs about this than I ever wanted to, lol! The one thing I cannot find is information on the actual installation of the countertop. Can you tell me how you did yours? My husband is talking about screwing it to the cabinets from the underside & using Liquid Nails in spots where a screw won't work. Any tips? If your cabinets have corner blocks, I would recommend cutting a oval slot to allow for expansion and use a washer and screw hand-tight. I don't recommend gluing it down. For us, we didn't bother attaching it to the cabinets. The weight of the wood keeps it very steady with no shifting. Enjoy reading your easy diy countertops ideas. Hi there! I have saved this blog post for some time now haha and we are finally ready to stain and seal our countertops. I bought the same ones as you last fall thankfully because they are no longer available. They are in our laundry room on a 15' wall of cabinets. They've lived in their original plastic all this time. There is no sink or water on that wall. In reading all of the comments on Amazon, many people mention the horrible smell but you didn't and since it looks like you did them inside, I just wanted to touch base with you about it. I am planning on doing them in my garage, but it is under part of my bedroom so I wanted to be prepared smell wise. I am thinking that I will probably do 3 coats because this countertop will often be used as a bar. We keep our Keurig on it daily and will set up a bar of all types of drinks for parties and such. Anything additional you can share with me would always be appreciated! How have the counters held up after 7 years +-? Hey Guys. Love your counter top to bits!! Looks amazing. Thanks for posting. Inspirational! Just one thought that may have been mentioned by someone already. Your link to Ikea takes you off your page. You can link so it opens in a new tab and people don't get distracted and stay on the Ikea site. You know? I'm forever doing it myself. Thanks again for a great blog and tips. Thanks for the comments. To answer all of the "would I do it again?" Yes I would! The counters have a few scratches and some worn spots on the stain. I am pretty sure the spots are from Dawn with peroxide dish soap. I am hoping to do an updated post soon and also put a fresh coat of stain on those spots and another coat of Waterlox over the counters. Kitchen accessories make life convenient and leave their mark on the taste and quality of the cooked and served food. A kitchen is like a work place that requires right tools in the form of utility appliances and cooking and serving items. Besides, decoration accessories are needed to add to the kitchen's value as an important part of the house. .
You said the project only cost $40. Seriously? Was that for the butcher block at ikea? Thank you for this info. When you're doing a search that's how it comes up. I went to another post that I have the kitchen total breakdown and I spent around $400 on the countertop. Maybe whoever started the $40 thing for got a 0. I actually think that IKEA discontinued this particular counter, but Lumber Liquidators sells BB so you may want to try there also. Hope that helps. Your blog is valueable for us. Thanku for sharing this blog. I read your post completely. I like it very much. It's amazing. You provide us counter tops. It's made our house and kitchen new in good look. I heartily thanks for this post. Thank You!!!! I read your article, all the informations that you share are benificial for us. Hi Vanessa! Loved reading your blog. I need some help. I've been working on our butcher block counter tops for MONTHS now. I can't seem to get the Waterlox right. I switched from gloss to satin (like you did) and I'm still having troubles. I have streaks on the countertops. I've tried using an old t-shirt, like you did, then foam brush, etc. I've contacted Waterlox and they respond and say apply more. I have and still have streaks. We used a darker stain and maybe that's why you can see the streaks? No idea. Did you have streaks when you applied yours? Did you apply it in thin or thick coats? I read your post completely and see the changes happening in your kitchen. I think you need some new tech. food processing equipment. You were my inspiration when we remodeled our kitchen in 2016. the waterlox is great! mine is "distressed" also - it gets a LOT of use. Shop stainless steel sausage stuffer from a collection of wonderful sausage stuffers from our online store with affordable price. We are selling varieties of specific sausage stuffers like 5 lb stainless steel sausage stuffer and dakotah water powered sausage stuffer. To know more about our products call on 800 300 5081.